Using LEDs with Battery Power - Here you can learn about LED and how to use them. 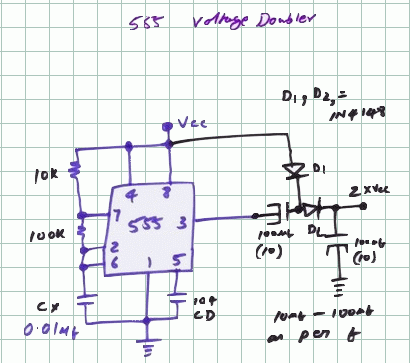 This is a simple voltage doubler using a 555, this can help boosting a low battery voltage to power a logic or opamp circuit. Voltage Doublers and Multipliers - Diodes and Caps can boost voltage for low power(current) applications. Voltage multipliers can be used to generate bias voltages of a few volts or tens of volts or millions of volts for purposes such as high-energy physics experiments and lightning safety testing." I drew this for a person who makes toys. On trigger at pin 2, Output goes high, timing cap charges from 0 to 2/3 Vcc the pin 6 of an internal comparator senses it & trips. Pin 7 goes low discharging the cap. Pin 3 goes low too. This ends the Timing Cycle. This circuit uses the two internal 1/3 and 2/3 comparators to create a Time delay switch.